Franz Joseph Haydn (1732-1809) composed Symphony No. 88 in G Major in 1787 at the height of his career. The symphony was dedicated to Johann Tost, a violinist in the orchestra of Prince Esterházy, Haydn's patron. First performed in Paris in 1787, the work enjoyed a splendid reception and is today among the often-performed symphonies of Haydn. The circumstances behind the composition of the Sinfonia Concertante for Oboe, Clarinet, Bassoon, and Horn cast a shade of doubt on whether Mozart himself actually composed the piece. Although the origins of the work are murky, the Sinfonia Concertante possesses many elements of Mozart's Paris style, and both content and construction do not discredit him. The music is direct and melodious, giving all four soloists opportunity to showcase their musicality. Beethoven began writing his first symphony in 1799 and completed the work in 1800. He conducted its first performance on April 2, 1800 at Vienna’s Burgtheater and received a lukewarm reception. This first attempt at a symphony did not showcase the heroic grandiosity that immortalized Beethoven among the masters of classical music; rather, the symphony is a clear example of the influence on Beethoven of his mentor, Haydn. Beethoven’s Symphony No. 1 is a wonderful tribute of one talented pupil to his great mentor, a testament to the art of music and more importantly, to the art of teaching. Arturo Molina ranks as the most experienced and effective Filipino conductor, having steadily led the MSO from its rebirth in 2001 to its present stature as one of the finest orchestral ensembles in the country. His clean and precise baton technique has made it possible for the musicians of the MSO to negotiate challenging orchestral scores. He displays a marriage of deep artistic insight into the essence of each work he conducts with the systematic and disciplined approach of a wise pedagogue. 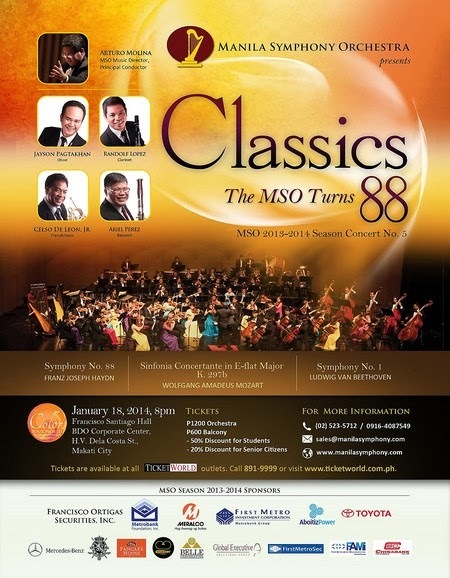 For ticket reservations and inquiries, please call the MSO office at (63 2) 523-5712, (63 916) 408-7549 or email sales@manilasymphony.com.